Since 1995, we are reckoned as one of the proficient manufacturers and exporters of Hot Filled Pouch or Jar Cooling Tunnel. This conveyor is designed and developed using quality examined components under the surveillance of our deft professionals. The given conveyor is utilized for cooling and transporting crate of food items. Drive: 2 H.P A.C. or D.C.
We are among the recognized Suppliers of Used Cooling Tunnel in India. 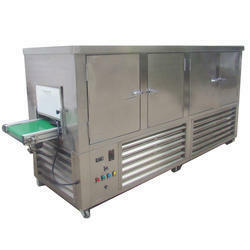 The Cooling Tunnel that we provide is checked by our experts so as to provide flawless machine. Our Cooling Tunnel VCS Cooling Tunnel is easily operated and maintained. They are highly cost effective and have given desired results at the client’s end. 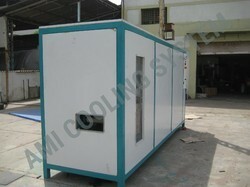 Cooling Tunnel for Ready To Drink Beverages like Juice etc.